At MedSpan Research, one of our key areas of focus is payer issues. Throughout my daily work, I hear about various trends within the healthcare industry. One trend that I continually come across, and have encountered personally, is the increase in the prevalence of high-deductible health insurance plans, including consumer-driven health plans. 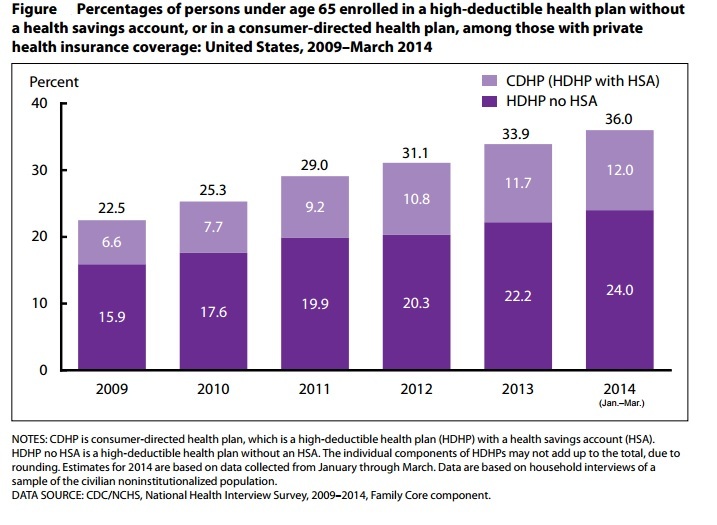 So, what is a high-deductible health plan? This trend of enrollment in high-deductible health insurance plans is not showing any sign of slowing down, which makes me consider my previous experience with a CDHP. Many years ago, I barely even thought about my health insurance and perhaps even took it for granted. If I had any sign of illness, I would not think twice before making an appointment with my doctor. Then, my company switched to only offering a CDHP. The health plan was meant to empower us to make better decisions about our health needs and encourage preventative healthcare in order to ultimately reduce disease progression. But, is it achieving its goal? Personally, when I had a high-deductible plan I found myself delaying or even outright avoiding treatments because I didn’t budget enough doctor visits into my finances. Overall, I am a very healthy individual. Therefore, I am the target of this plan. My employer, the health plan, and I pay less upfront. I pay for healthcare when I need it. But, I can’t help but wonder if this structure does more harm than good for some members, including myself. Does it make me less likely to seek care when I need it? Is it encouraging an otherwise healthy individual to not seek care and allowing disease to progress beyond the stages of treatment? Is high-deductible insurance going to save payers, employers, and members in the long run, or ultimately lead to increased costs? I can’t say for sure, but, I’m interested to know what you think! How do we change the focus of healthcare to preventative medicine without alienating the sick? *Note: The information in this blog represents the opinion of the author and not of MedSpan Research. Entry filed under: Uncategorized. Tags: high deductible health plan.